Aflatoxin contamination of food products has serious health and economic ramifications globally and within the United States. Aflatoxin is produced by the fungi Aspergillus flavus and Aspergillus parasiticus and is highly toxic and carcinogenic to both humans and animals when ingested or inhaled. The fungi that produce aflatoxins occur naturally in the soil of warm and humid regions of the world. The fungi colonize corn, peanuts, cottonseed, and tree nuts, among other crops. Aflatoxin-producing fungi can contaminate crops during growth, harvest, and storage. Aflatoxin contaminated crops fed to animals can affect milk products and meat. MAFES scientists Dr. Xueyan Shan, assistant research professor in the Department of Biochemistry, Molecular Biology, Entomology and Plant Pathology, and Dr. Haibo Yao, associate research professor in the MSU Geosystems Research Institute, have mounted a two-pronged attack on aflatoxin, developing ways to resist contamination in food products, and to detect aflatoxin after it has taken root. “Aflatoxin can cause death when consumed in large amounts, or lead to chronic diseases in both humans and animals. In developed countries where there are strict screening procedures, it is mostly an economic issue—it is expensive and time-consuming to screen corn with the traditional chemical tests,” Yao explained. Weather is a major factor in the development of aflatoxin; fungal growth tends to be more prevalent during years with high temperatures and drought. While development can be somewhat offset through good cultural practices, such as irrigation, use of fungicide and alteration of planting dates, these practices are less effective during severe drought. Further, they tend to be expensive for corn producers. “In 1998, a severe aflatoxin epidemic in corn occurred in Mississippi and throughout the Southeast. The rejection rate for loads of corn due to aflatoxin contamination was greater than 50 percent causing considerable economic loss to corn farmers,” Shan stated. However, in areas where screening isn’t possible, aflatoxin contamination is a much larger problem. “In developing countries, aflatoxin is a public health issue. Corn is a staple for many people and they rely on it for basic nutrition. Aflatoxin contamination can cause the above mentioned problems, as well as stunting childhood growth,” Yao said. “Further, it isn’t only the corn products themselves that can cause health issues; aflatoxins can also be detected in milk if contaminated corn is used as animal feed. By both preventing the growth of aflatoxin producing fungi in the first place, and by creating inexpensive, efficient screening processes, researchers will be able to solve economic and health issues. Shan, who is working on identification of resistance genes in corn for aflatoxin reduction, explains why simply cooking food contaminated with aflatoxin or processing isn’t an option. “Aflatoxins are resistant to heat, milling, and chemical treatments and are not affected by processing or cooking. The removal of aflatoxins from contaminated corn products is very difficult. Once corn is contaminated very few detoxification and utilization options are available,” Shan explained. While researchers have explored various methods for either removing aflatoxin from corn, or preventing it from forming in the first place, the answer may lie in bolstering the corn’s ability to resist aflatoxin. “Breeding corn lines resistant to A. flavus infection is the most promising and exciting alternative. Characterization of naturally occurring resistant varieties of corn will greatly facilitate the breeding of resistant corn hybrids. To date, significant levels of corn host resistance to aflatoxin accumulation have been obtained in corn inbred lines such as Mp313E and Mp715, which were developed by the USDA-ARS Corn Host Plant Resistance Research Unit in Mississippi. However, the resistance needs to be integrated into elite corn lines to achieve high yields of corn,” Shan said. Breakthroughs in gene sequencing technology have allowed scientists to identify exactly which genes carry resistance. They hope to then use CRISPR technology, which allows scientists to edit the genome of an organism to produce specific traits. “Our next steps are to identify the functional resistant genes in the major corn quantitative trait loci, or to identify the multiple genes that impact resistance, for precision breeding. Candidate genes will be selected for application of CRISPR techniques,” Shan explained. While Shan and several hard working graduate and undergraduate students identify and evaluate genes for breeding of corn resistance to aflatoxin, Yao is developing efficient, economical ways to screen for aflatoxin already present in corn. 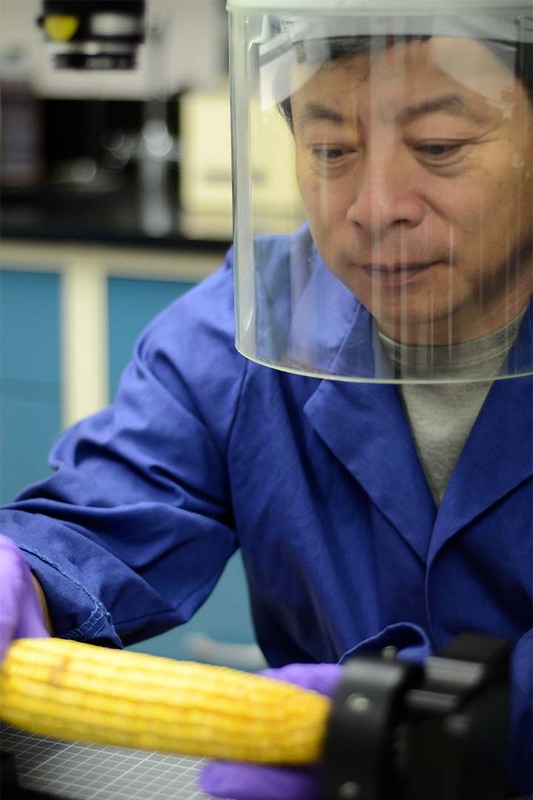 Instead of sending samples off for chemical testing, he is developing a way for users to detect aflatoxin at a glance. 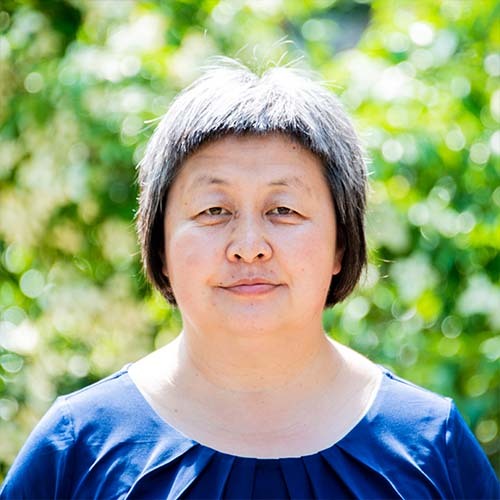 “We are working on a rapid, non-invasive method for aflatoxin detection that uses hyperspectral imaging, or a method for collecting information from across the electromagnetic spectrum,” Yao stated. 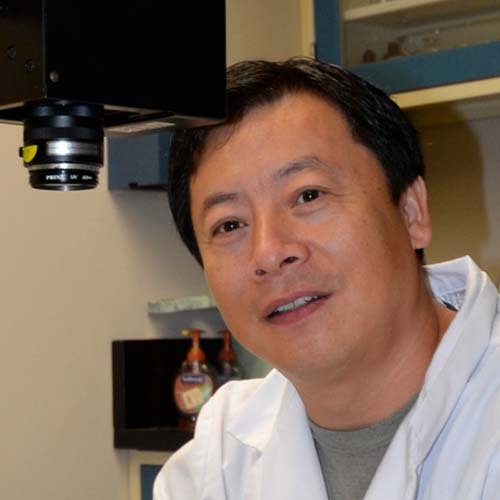 Yao and colleagues developed a tool called the “Aflagoggle” based on a patented detection technology. 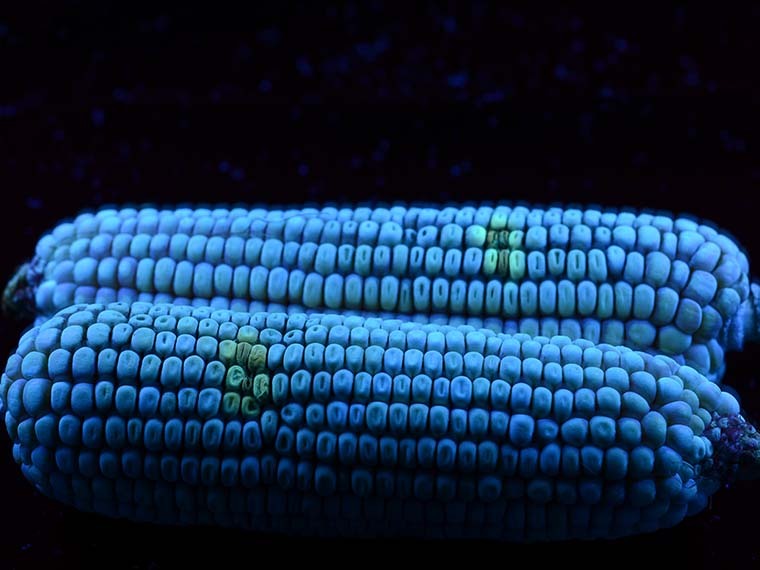 By shining UV light on kernels, they are able to view aflatoxin contamination as glowing patches on corn kernels. “Aflagoggle’s benefits include low-cost and extreme portability. This means that we can place this affordable technology in the hands of producers and consumers around the world. However, we are still in the process of improving the detection accuracy,” Yao said. Between efforts to incorporate aflatoxin resistant genes into commercial corn and the creation of detection technology that can be used around the world, MAFES researchers hope to make an impact on this global food insecurity issue. This research was supported by the Mississippi Agricultural and Forestry Experiment Station Strategic Research Initiative, USAID, USDA, National Science Foundation, National Corn Growers Association, Launch Tennessee, and the Gates Foundation. Aflatoxin research in MAFES is in collaboration with the USDA Agricultural Research Service. Passion At Work: I am excited about research to reduce mycotoxin contamination in food and feed, providing food security and safety for future generations. Passion At Work: I am passionate about reducing aflatoxin in corn in a sustainable manner, ensuring food security and safety.